as I received several emails with questions about the preamplifier which I am using for my LB external RX antennas like W2PM MiniDiamond loop, EWE loop, K9FD loop etc. I decided to post over here some informations about this unit. Please read his entire document before starting to build this project. There is data contained within that is necessary to obtain maximum performance from this circuit. Be sure that you downloaded the latest - updated revision. I started with building this preamplifier in the end of 2002 as Christmas project but I finished it in Jan of 2003. The current version of the W7IUV document was at that time Revision 5 copyright 1998-2009. 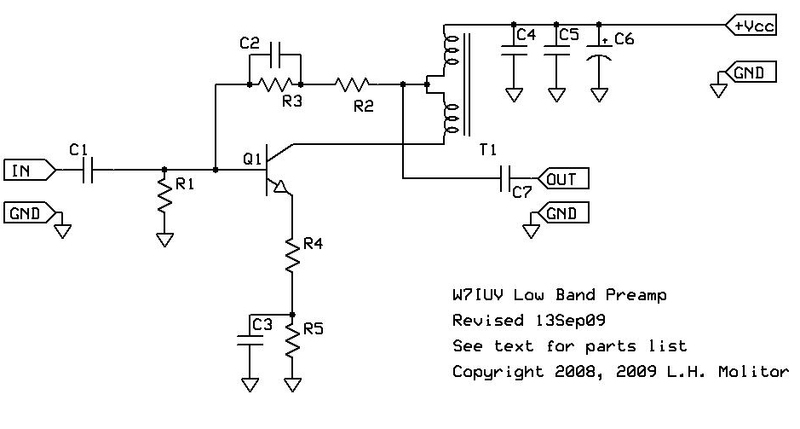 It is very important to follow the inctructions for building the preamplifier and use the parts values as described and recommended by Larry in the document. The most important part of this design in my opinion is the transformer and working state of the transistor 2N5109. You must follow the winding rules as same as core material for transformer and finally you must use prescribed current of the transistor in order to reach expected performances. Testing the assembled preamplifier is straight forward. Before applying power double check your work. The most common problems are solder shorts and resistors inserted in the wrong place. 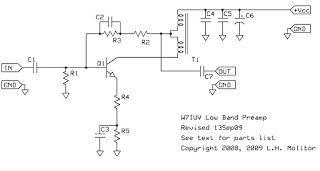 Once you are satisfied you have correctly assembled the circuit place 50 Ohms terminations on the input and output. Apply the Vcc terminal and ground. Measure the current drawn with a digital ammeter. It should be 75 mA +/5mA. Remove power and then remove the 50 ohm terminations. Re-apply power and measure current again. It should be the same as it was with the terminations in place. If not the device is oscillating and you need to fix that before proceeding. Oscillations are usually in the GHz region and are caused by poor layout and/or poor quality capacitors. Bypass caps with very long leads could also be a cause. In fact I used in this version thru hole components but I can recommend to use high quality SMD parts. If you have proper alu-case then you can use it as the big heatsink. Final quick measurement in the lab confirmed it's parameters. The gain is slightly lower than expected. Also be careful which power supply you are using. In some cases you can get strange noise from the PSU (mainly switched unit) I am using linear PSU with enough power and proper filtering from AC mains.